How many young drivers crash while driving distracted? 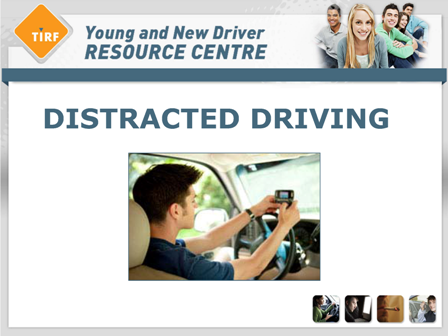 What distractions are most common for young drivers? Do passengers increase the crash risk for young drivers? How do passengers distract young drivers? How do distractions affect young drivers compared to experienced drivers? Who, among young drivers, is most likely to get distracted? How many Canadians are concerned with distracted driving? Do young drivers understand the risks associated with using hand-held devices while driving? Are there provincial/territorial distracted driving laws? What habits can young drivers develop in order to reduce distracted driving? How can distracted driving be reduced among young drivers? Are in-vehicle technologies developed by car manufacturers effective in reducing distracted driving? Distracted driving occurs when a driver’s attention is diverted away from driving because they are focused on something non-driving related. The effect of distracted driving: a reduction of the driver’s awareness of changes in the road environment, decision-making about how to respond to changes, and their ability to safely control the vehicle. Common errors resulting from distracted driving: following too close, failing to maintain lane position (wandering or weaving), irregular speed, red-light running and delayed reaction times. The consequences of distracted driving: increased risk of corrective actions (such as slamming on the brakes to avoid hitting another vehicle, adjusting steering in order to maintain position in the lane), near-crashes or crashes. Humans are ‘serial processors’ of information, meaning they can only effectively process one thing at a time,4 or focus their attention on one task at a time. The ability to ‘multi-task’ is a common misconception. In reality, people cannot multi-task and by trying to do so, neither task receives the necessary amount of attention. Driving is a complex task that requires “divided attention”, as drivers must perform cognitive, manual and visual tasks at the same time. This means that drivers must be able to physically operate the vehicle as well as observe the environment, recognize hazards and decide how to respond to them. Adding in other tasks unrelated to driving (e.g., eating, talking on the phone, changing the radio) to this already heavy workload can overload the brain. Once the brain is overloaded, driving ability can suffer because the brain is unable to give the needed amount of attention to all the demands at hand. Studies of in-vehicle cell-phone use found that both types of drivers are negatively affected, but experienced drivers are more likely to account for their distraction by slowing down or leaving more space between themselves and the car in front of them. Young drivers, on the other hand, drive at similar speeds regardless of whether they are on the phone or not and also have been found to wander in their lane when on the phone.20 This shows that the inexperience of young drivers makes distracted driving an even more dangerous behaviour than an experienced driver, adding to their already high risk of crashing. A similar poll was conducted with young Canadians. Of all the road safety issues, the second highest rating of concern for young drivers was texting while driving with 83% rating this as a very or extremely serious problem (drinking and driving rated as the first).25 Distracted driving was fifth on the list with 69.2% rating this as a very or extremely serious problem. Although hands-free cell phones have been promoted as a safe alternative to hand-held cell phone use while driving, hands-free functions should not be relied upon by young drivers to avoid distracted driving. There is significant research saying that they are not actually as safe as people may believe. A study conducted by the National Highway Traffic Safety Administration (NHTSA) revealed that hands-free device use often involved hand-held set up and use before and after making a call or sending a text message. Even during hands-free use, voice systems often fail to recognize commands, requiring the user to make physical corrections, which creates further distraction.30 Even if hands-free devices were to operate perfectly, they still create a significant amount of cognitive distraction to drivers. Cognitive distractions can lead to impairments such as: suppressed brain activity, increased reaction time, missed cues and decreased accuracy, and, decreased visual scanning,31 all of which are essential functions needed to drive safely. Are there specific provincial distracted driving restrictions for young drivers? Educational campaigns and programs create awareness about the dangers of distracted driving. Young drivers can help reduce distracted driving by getting involved in these campaigns and programs. For example, the Drop It and Drive Campaign (D.I.A.D) uses blogs, social media and on-site presentations to spread awareness about distracted driving. The goal of the campaign is to make distracted driving as socially unacceptable as drinking and driving. The ‘Distractions Undermining Motorist Behaviour Car’ (D.U.M.B car), sponsored by the Insurance Bureau of Canada, is a distraction simulator that travels across several provinces during the summer to different festivals and events and is operated by university students.41 This car tests a driver’s reactions to common distractions (cell phones, eating or drinking, music) and gives youth a controlled environment to get a feel for how dangerous distracted driving can be. By either trying out the simulator or getting involved in the project itself, youth can use this experience to develop safe driving skills. Another initiative that youth can get involved with is the Canadian Road Safety Youth Committee. This program strives to raise awareness about road safety issues and also advocates for improved road safety policies. Members are part of a national network of young people who speak out on youth related issues. The dangers of distracted driving could be expressed through this program. For more information go to: www.youthroadsafety.ca. Aside from joining clubs or programs, young people can take advantage of accessible social media (such as Facebook, Twitter or YouTube) in order to spread the anti-distracted driving message. By creating as much public awareness about the issue as possible, distracted driving will be recognized as unacceptable and unsafe – hopefully influencing drivers to focus only on the road when driving. Vehicle manufacturers should focus on minimizing visual and manual interaction with in-vehicle devices. For example, a ‘vehicle’ mode on devices would lock-out more complex features, such as texting or surfing the web.43 In order to ensure the safest driving environment as possible, young drivers should not use any in-vehicle technology and should not install any of these devices in their vehicle. Canadian Automobile Association (CAA). (ND). Distracted Driving Laws in Canada. Driven to Distraction. Retrieved from: http://www.caa.ca/driventodistraction/what/dist racted.html. Canadian Council of Motor Transport Administrators (CCMTA). (February 2012). Canadian Fines and Demerit Points For: hand-held cell phone or electronic communication device use and entertainment video display use. Retrieved from: http://www.ccm ta.ca/english/pd f/strid_distraction_canadian _fines_and_demerit_ points_jan_2012.pdf. Curry, A. E., Mirman, J.H., Kallan, M.J., Winston, F.K., Durbin, D.R. (2011). Peer Passengers: How Do They Affect Teen Crashes? Journal of Adolescent Health. In Press. Dingus, T. A., Hanowski, R. J., Klauer, S.G. (2011). Estimating Crash Risk. Ergonimics in Design: The Quarterly of Human Factors Applications.19(8): 8-12. Feldman, G., Greeson, J., Renna, M., Robbins-Monteith, K. (2011). Mindfulness predicts less texting while driving among young adults: Examining attention-and emotion-regulation motives as potential mediators. Personality and Individual Differences. 51(7): 856-861. Fitch, G. M., Soccolich, F. G., McClafferty, J., Fang, Y. Olson, R. L. Perez, M. A. Hanowski, R. J. Hankey, J.M., & Dingus, T. A. (2013). The impact of hand-held and hands-free cell phone use on driving performance and safety-critical event risk. National Highway Traffic Safety Administration (NHTSA). Government of Alberta. (2011). Distracted Driving Legislation (Bill 16). Transportation. Retrieved from: http://www.transportation.alberta.ca/distracteddriving.htm. Harkness, R. (2013). Summary of Research Findings on the Crash Risks Related to Hands-Free Texting While Driving. ADEPT Driver. Hedlund, J. (2006). International Conference on Distracted Driving. Summary of Proceedings and Recommendations. International Conference on Distracted Driving. October 2005. Herrmann Lynn. (2011). Survey: Distracted driving with young drivers a ‘deadly epidemic’. Digital Journal. Retrieved from: http://digitaljournal.com/a rticle/304444#ixzz 1mT6dEAhO. Kircher, K., Patten, C., Ahlstrom, C. (2011). Mobile telephones and other communication devices and their impact on traffic safety. The Swedish National Road and Transport Research Institute (VTI). Lam, L.T., Norton, R., Woodward, M., Connor, J., Ameratunga, S. (2003). Passenger carriage and car crash injury: a comparison between younger and older drivers. Accident Analysis and Prevention. 35(6): 381-90. Marcoux, K., Vanlaar, W., Robertson, R. (2011). The Road Safety Monitor 2010: Youth Drinking and Driving. Traffic Injury Research Foundation. Ottawa, Canada. Marcoux, K., Vanlaar, W., Robertson, R. (2012). The Road Safety Monitor 2012 Drinking and Driving in Canada: Trends. Traffic Injury Research Foundation. Ottawa, Canada. McEvoy, S.P., Stevenson, M.R., McCartt, A.T., Woordward, M., Haworth, C., Palamara, P., Cercarelli, R. (2005). Role of Mobile Phones in Motor Vehicle Crashes Resulting in Hospital Attendance: A Case-Crossover Study. British Medical Journal. 331(7514): 428-430. National Highway Traffic Safety Administration (NHTSA). (2010). Distracted Driving and Driver, Roadway, and Environmental Factors. September 2010. DOT HS 811 380. U.S Department of Transportation. Washington, DC. National Highway Traffic Safety Administration. (2011). National Phone Survey on Distracted Driving Attitudes and Behaviours. December 2011. DOT HS 811 555. U.S Department of Transportation. Washington, DC. National Highway Traffic Safety Administration. (2006). Teen Unsafe Driving Behaviours: Focus Group Final Report. September 2006. DOT HS 810 670. U.S Department of Transportation. Washington, DC. Ranney, T.A. (2008). Driver Distraction: A Review of the Current State of Knowledge. Technical Report DOT HS 810 810 787. National Highway Traffic Safety Administration. U.S. Department of Transportation. Washington D.C.
Robertson, R., Marcoux, K., Vanlaar, W., Pontone, A. (2011). The Road Safety Monitor 2010: Distracted Driving. Traffic Injury Research Foundation. Ottawa, Canada. Royal Canadian Mounted Police (RCMP). 2009. The D.U.M.B Car (Distractions Undermining Motorist Behavior). Traffic Safety Programs Catalogue. Retrieved from: http://www.rcmp-grc.gc.ca/ts-sr/catalogue/dc-ad-eng.htm. Smiley, A. (2005). What is Distraction? International Conference on Distracted Driving. Human Factors North Inc.
Smiley, A., Caird, J.K., Smahel, T., Donderi, D.C., Chisolm, S., Lockhart, J., Teteris, E. (2008). The Effects of Cellphone and CD Use on Novice and Experienced Driver Performance. Executive Summary. Driver Distraction. Insurance Bureau of Canada. Transport Canada. (September 2005). Strategies for Reducing Driver Distraction from In-Vehicle Telematics Devices: Report on Industry and Public Consultations. Road Safety and Motor Vehicle Regulation Directorate. Transport Canada. (February 2012). Driver Distraction: Current Legislation. Retrieved from: http://www.tc.gc.ca/eng/roadsafety/safedrivers-major-distractions-1073.htm. Vanlaar, W., Simpson, H., Mayhew, D., Robertson, R. (2007). The Road Safety Monitor 2006. Distracted Driving. Traffic Injury Research Foundation. Ottawa, Canada. Vanlaar, W., Mayhew, D., Marcoux, K., Wets, G., Brijs, T., Shope, J. (2009). An evaluation of graduated driver licensing programs in North America using a meta-analytic approach. Accident Analysis and Prevention. 41: 1104-1111. Virginia Tech Transportation Institute (VTTI). 2009. New data from Virginia Tech Transportation Institute provides insight into cell phone use and driving distraction. Virginia Tech News. VirginiaTech. Retrieved from: http://www.vtne ws.vt.edu/a rticles/2009/07/2009-571.html. Williams, A.R., Ferguson, S.A. (2002). Rationale for graduated licensing and the risks it should address. Injury Prevention. 8: ii9-ii16. Wilson, J. (2005). Legislation and regulation in Canada with respect to driver distraction. Paper presented at the International Conference on Distracted Driving, Toronto, Canada, October 2-5.